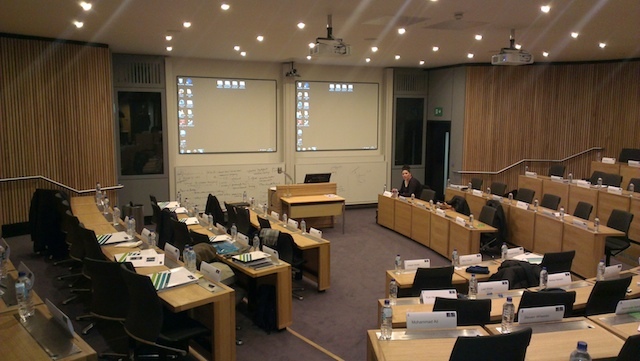 The first module has started at Oxford. The neverending autumn has just ended in Moscow and mid-January hard frost season has begun, so it was twice as pleasant to get from -20 to +10. The weather forecast promised 70% rain probability, but finally we got into the rest 30% on most of the days. On Sunday we had ”day zero” of studying. There were a couple of events where we could come to know each other. The second one was quite simple, a lunch at the Ashmolean Museum: a beautiful place, good food, nice talks, but nothing special. And the starting event was quite unusual. It was called Oxford Pursuit and was created so that we could get to know each other and the city faster. All the people were divided into groups of four, got the questions (18 blocks 2 questions each) and had to find the answers to them within two hours. The blocks were made in a way that one question could be answered with the information from the Internet, but to answer another one we had to find a right building in the city and come there. For example, we had to find the text under a painting in a bar of a famous hotel, or sometimes just have a picture taken in front of the solution. We lost. Chances to win were high; we had a person who had lived in Oxford and knew the city well, but we did not take the questions too seriously, purely guessing some last ones. But it was fun and made some difference in the flow of questions “Who are you? Where are you from?” typically following an attempt of 80 people to get to know each other and making one’s head swing. Monday morning was allotted for organizational lectures and some more socializing. After lunch we had two more case-based classes. David Upton started. I think he was the first on schedule to wake everyone up. He is a very emotional and lively teacher. The case was very difficult, or to be more precise, very detailed one, about 15 pages of description. Group discussions were immediately turned into common dispute. It was interesting not only from the problematic point of view, but also as an example of teacher’s work. Tim Morris (Leadership course teacher) is a calmer person. The case was easier, but it led to even more active discussions. An interesting thing: he had the longest list of reading for the class, but the class itself did not touch theory at all. As far as I understand, it is the common style: everything that can be read is read, and no time is devoted to it at the lectures. Mornings begin here. 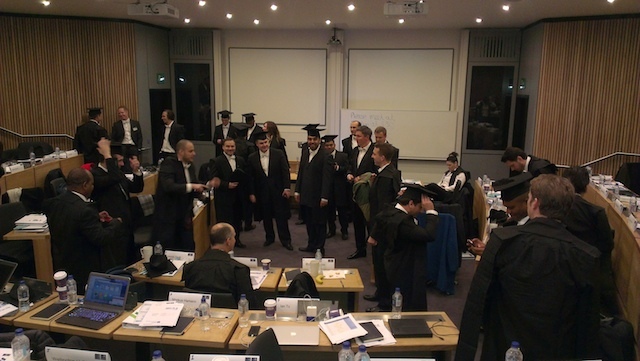 It is the main hall, and for group discussions we either go to classrooms or sit at the tables in coffee breaks room. Again the day started with several lectures not related to the main course. Mungo Wilson began with some kind of an announcement of what problems were in principle going to be discussed. He will be reading something serious in summer, and now it was sooner not a lecture, but an entertaining talk on certain economic research works. It is interesting that at the lecture we were discussing the name of the economist who took the Nobel Prize this year, and it was Robert Shiller. A year ago I tried to watch his lectures on financial markets on Yale website, but after John Merriman’s story and Ben Polak’s game theory I watched there, he seemed to be too boring. And he turned out to be a serious guy! Which does not make him a strong lecturer anyway. Then organizational lectures followed: exams rules and regulations, plagiarism, working with library funds. I had an impression that they run lecturer preparing courses in some local theatre, as everyone who is going to talk has not only a vivid own style but the whole scenic image. It is especially pleasant when the topic is potentially dull, but in fact it turns into some funny stuff. For the evening we had a long lecture on leadership and decision making with Owen Darbishire. There was a case again and this case turned into an educative story. Owen gave its name in the reading list, I had found it on the Internet, read it and already had a thoroughly thought decision handy. Others in the group (the discussions took place in groups of six) were reading on the spot and I had an obvious advantage in knowing the situation. But I have not guessed that I should have taken the initiative, and overestimated the measure I should be agreed to, so as a result we came to the hall without common decision. Next time I should think more seriously about argumentation of my opinion. At the end of the day there was another preliminary lecture. There was a guest speaker, Victor Mayer-Schönberger, but all in all it was the announcement of GOTO project, one of thesis work types that we would have to do. The day began with Allan Morrison’s lecture on principles of forming markets regulating mechanisms in the context of how the role of investment banks was changing throughout the last 200-300 years (well, this is a significant trait of education here, the analysis for the past couple of centuries comes out from time to time). Also we discussed essay writing approaches and had a lecture on strategy by Mark Ventresca at the end of the day. It was not even on strategy in its classical representation, but on how this term can be broadened. The main event of the day was visiting colleges. The thing is that the schedule is very tight, and not many people live right in college, so almost no one had a chance to visit it. And today the middle of the day was allotted especially for it, so everyone went there to get acquainted and register. Well, my choice was not a mistake at all. It is even cooler inside than outside. 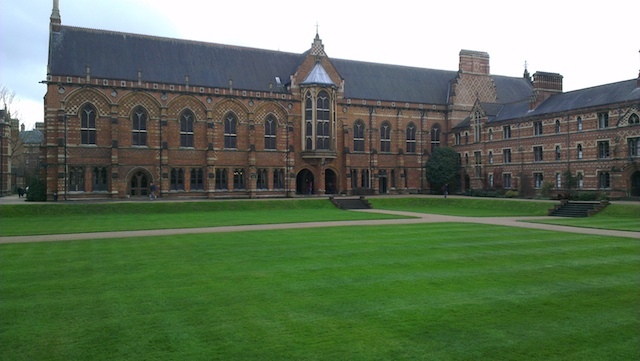 There is a very nice inner yard, an awesome chapel, dining space, and library. The library is simply wonderful. At that MCR looks like a normal student dorm, with billiard and a bottle of vodka behind the fridge. By the way, surprisingly I see people buying vodka or beer in Oxford stores, but I saw no one buying whiskey or wine. Elegant looking girls coming out of Sainsbury’s with a bottle of vodka as the only purchase look charming (but they seem to usually mix it in cocktails here, instead of drinking it pure). Here is an interesting detail. The student who arrives at college signs the obligation to follow its rules in a special book. So, this book was started in 1870 and contains the signatures of all students for the past 140 years. Today a solemn ceremony of admission to university students (matriculation) took place. From the one hand, it is very unusual: special clothing, old-time procedures etc. From the other hand, the story will not be too interesting. It reminds a tourist excursion a little. The following events were much more unusual. If group work before implied only small tasks, today there were two really serious problems. Each looked like a game. The first one really was a game, another one was more serious and combined group work coordination and anti-crisis training. Personally for me it turned out to be really a complicated task where I failed a whole lot of elements, and all in all everything was highly educative. Now at last we have fixed working groups, so there still is an opportunity for learning to cooperate in this team. In the evening, apparently as the continuation of matriculation there was a gala dinner at Trinity College. It was beautiful and tasty. One of the very pleasant impressions is always good food. As the dinner became the part of the whole process, the upshot is that I am submerged into ceaseless English speaking from 8 a.m. to 10 p.m., or 14 hours a day. Now it is quite exhausting, but even after several days it eases off, so eventually it will pass. Almost all day on Friday was devoted to statistics and work in Excel. Both things have been my basic working instruments for many years, so I was mostly doing my own stuff, sometimes getting into action when the group was doing the exercises. But still statistics should be revised, as a part of terminology is different from the one I am used to, and a part of tests is required to be done in group. But all in all it was a boring day. But it must be noted that that those for whom statistics was a new topic, were really happy with the teacher. It was the same person who was talking about the principles of carrying out the exams on Tuesday. One should try really hard to make a person who has, for example, legal education, not feel awful when within one day he is made to pass the way from understanding probability theory and statistical distribution to correlation and its application to economics. And make it in a way so that all the others do not fall asleep. But James Taylor succeeded. His manner of teaching is a bit theatrical (judging by my own experience, I can say that one should be somewhat brave for it) and is as a result easily perceived. In the middle of the week we were told that Business School provided us with lifetime membership in Oxford Union, one of the oldest debate societies. On Saturday trial debates were organized for us, just in the team of student Business School and with quite a typical topic. Debates take place between two groups, one is supporting the announced topic while the other is opposing. Each group has four speakers and a support team. I took the risk and enrolled as a speaker to one of the groups. As a result I was writing my speech half a night, then watched different speakers at ted.com, Amanda Palmer’s speech already known to me among them, decided that I did everything wrong and spent the second half of the night rewriting the text. It turned out to be quite good, but already while speaking I forgot or mixed a certain part of my ideas. It was a very interesting experience, especially for removing psychological barriers with giving talks in English. Then the module was over. Everyone went home taking 6-7 kilograms of books we got at the course, the task for the first essay (within GOTO project) and a lot of small things to complete in order to integrate into online part of the training.